The only way to get to the small town of Radda in the Chianti region of Tuscany, is by train …that will only take me to Siena. From there I need to take the bus to Radda. You might wonder why Radda?…No, I did not know anyone there at the time and have never heard of the town before… I just picked a hotel with a view on the internet and have decided that I will make that my base! And what a choice! Radda is a very small medieval town ( in the Province of Siena in Tuscany, Italy – about 35 km southeast of Florence and about 15 km north of Siena). Like most Italian towns in that region, it was built on a hill and therefore has a lovely view of the surrounding valleys! The hotel Relais Vignale has become my home for the 10 days that I have stayed in Radda. As I have said – it was purely picked because of the view! And the view was STUNNING!… so was my stay , the staff and the hotel’s food!!! Ok… before I elaborate on Radda…let me just brief you on the train trip! It sounds simple and straightforward enough to hop on a train from Rome to Sienna and then take a bus to Radda…easy? – but trust me, it was not! The train station (Termini station in Rome) was a nightmare to start with! It is massive! About the size of a medium size airport with the amount of people that you will find in a large airport! The majority standing around gazing at the overhead screen that is suppose to tell you when your train is arriving and where! It took me a while to figure out which number on the ticket is the train no to look out for because the destination is not even remotely the same as on your ticket! I was heading to Siena according to my ticket, but the train no indicates Milan! Well… would I have loved that! I was waiting for about an hour – hanging onto my luggage like everyone else – before my train was announced. It then started to make sense to me why people are suddenly taking off as if attacked by a swarm of bees and bolted for a platform as if they were late! You only have about 10 minutes to RUN to any one of the 28 platforms, find your train, find the compartment number as indicated on your ticket (figure that out in Italian!!) and the to find your seat! It was a nightmare!! !- I barely made it with my shadow still on the perron when the train took off like a bullet! Anyway … that should tell you that Radda is remote! There are only 2 buses daily (except on Sundays!) 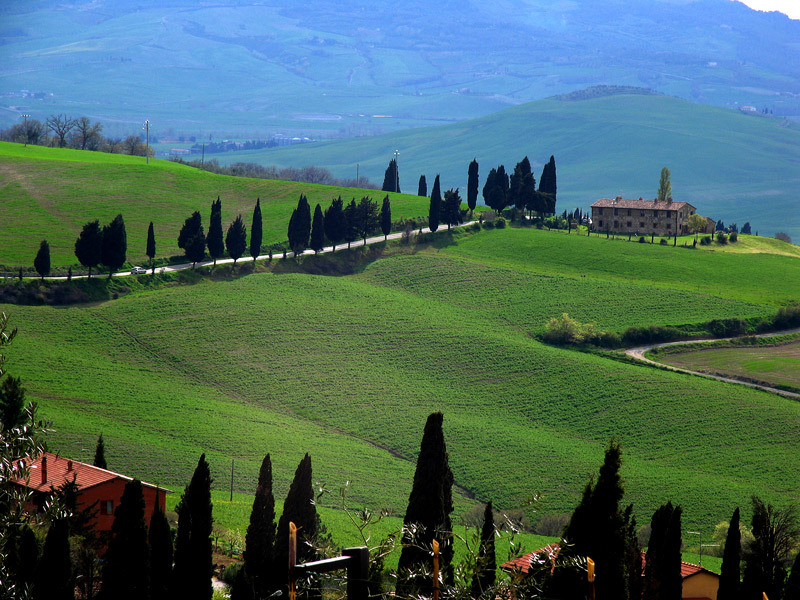 from and to Radda – and that is to Siena and Florence. No taxi’s in Radda and no bicycles to rent – they do have scooters… but I was told that even semi experienced guys often stack them on those narrow winding roads – so with my level of inexperience, it became a no-go-area! The plan was never to go to Florence! That will have to wait for next time too! Sienna was on my list but my aim was really to just relax and enjoy the people , the wineries and the food of a small town and surroundings. With no wheels to take me from Radda to the next village (10 – 15 min drive) and with an urgent need for exercise, I have decided to just walk there. It can’t be that hard? I can see the place from where I am having breakfast on the terrace at the hotel and did not think it should be a problem. The maps are very sketchy …you never know if the name indicated on the map is a town, a village or a winery… but it did not matter – I was set to walk to the first place, have lunch and if I feel like it walk further and then come back in my own good time! The road and scenery on my way down from Radda were to die for! I stopped every 5 min to take another picture of vineyards and olive groves that forms part of a patchwork picture of the valley! But that was going downhill! I started at 7.30 am while it was nice and cool. I even turned into the wineries on the way just to see what it looks like (another km added to my journey every time I have done that!). All of them very picturesque! But as I arrived at the place on the map (that is now 2 hours later) that indicated the first village (or that is what I thought it is) I found an old house on the one side that was empty and falling apart and another one on the other side that looks like it might still be inhabited and not medieval ghosts like its neighbour! No town though!… So I kept going! At about 12.30pm I got to a cross road. The one is leading to a village (I think!?) up on a hill about another 5 km away – I could see it from there – and the other road leads to a huge and very well known Wine Estate called “Castello de Albola” – the winery was closer, I was hot and tired and so over walking! So the decision was easy enough! A slideshow of journey to Castello d’Albola : You will need Adobe Flash downloaded to see the picture slide show underneath every post I made! As I arrived at the tasting room where the tour starts, I met Veronique (a charming Belgium girl that has been with the company for many years!) that informed me that there is no 2pm tour as no-one booked! She was amazed that I walked that far and immediately offered wine (seeing that the wine tasting has been set up already!) 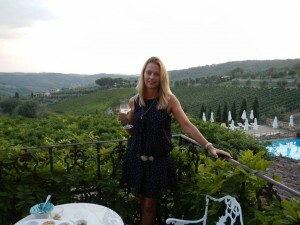 – but I was happy with water (and hesitant to take wine if I have to walk back!! ), wanted to have my lunch and the wonder around having a look at this amazing place! Veronique was not going to let me get that far for nothing! She took me on a wonderful tour through the private gardens and around the mansion of the Zonin family (the owner was away for the week – they do not normally do this area with tourists) – all the different cellars and then a wonderful taste of the variety of wines and olive oil… it was just magic – my own little private tour! By now I have made up my mind – I was NOT going to walk back – Enquiring about a lift back to Radda or hitch hiking (they have a fabulous restaurant there too but all the guests came with 4 or 5 in a car ) – I managed to get a lift back with the receptionist!… but only at 5pm! Veronique was going to do a tour for busload of Russian tourists at 5pm and we have decided to start setting up the tasting and selling area! It brought back memories from my days in Vredendal, helping Hanlie,a friend of mine setting up displays at the wine stalls in Cape Town! It was great fun! The place is magic. A little bit about Castello d’Albola: The medieval castle of Albola is actually a real castle just about a km from the estate – I could see it from there. The imposing Estate buildings of Castello d’Albola dates back to the 12th century and although it was extensively repaired and rebuild in the 15th century, it is still a sight to behold! The two majestic towers was meant for defence and was built between 1725 and 1739. The original entrance to the estate house is a km long avenue of two rows of cypress trees!.What an entrance that must have been – it is not in use any more but is still maintained for the looks. The parklands around the estate is lush and beautiful with a little dam and ducks on the side. The estate (with its very popular restaurant ) is totally self sustained as far as their vegetables, fruit, herbs, wine and olive oil is going and they often have enough wild boars in the area to use that as a very traditional dish of Chianti on the menu! (By the way – that was my favourite Chianti dish … Chianti Wild Boar stew!!!). The entire garden of the estate is a vegetables, fruit and herb garden and looks a picture! How clever to have useful plants instead of shrubs and flowers! 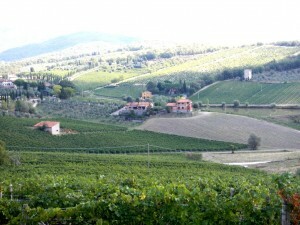 The estate exists of 850 hectares has 157 hectares of vineyards and 4000 olive trees. It is one of many wineries of the Zonin family. 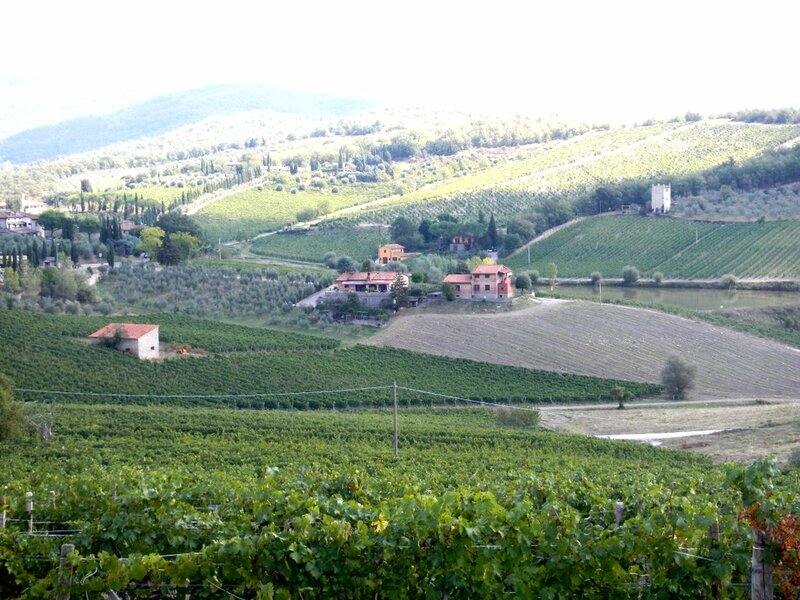 The Zonin family has been making wine since 1821 and currently operates Italy’s largest privately owned vineyard and wine-making complex. The house produces 25 million bottles and exports its wines to 69 countries… So no small fry at all!! Slide show of Radda : You will need Adobe Flash downloaded to see the picture slide show underneath every post I made! The typical tourist shops are also to be found in Radda, as well as two small clothing shops and two leather (mainly bags and shoes)shops, a delicatessen shop and a fabulous kitchen shop (where I bought my gnocchi roller)! Beside these shops, there are lots of restaurants in Radda! (I counted more than 10!) The wonderful thing about Radda is that they also have about 5 or 6 wine tasting outlets for different wineries where you can taste wine, olive oil and Balsamic vinegar! A wonderful experience and they love it if you ask for more wine and often offer you a full glass of your favourite wine! A cheap way of having a drink and a snack before sunset! So… if you can make that your entertainment, then you don’t need a car! One of my best experiences in Tuscany was my Italian cooking experience at Toscana Mia cooking school! It was not a class … it was really an experience! I was picked up in town by one of the two sisters (Simonetta) to take me to a farm about 10 min drive from Radda. A beautiful road and the house was an old character of a place! Typical of the medieval buildings you see around Tuscany with the squarish tower (although that has apparently been demolished in an attack in the medieval times and is now much lower as it used to be). Paola (the other sister) presented the class and we were only four students for the day – Adam (also from Australia) Todd and Leona (a couple from the US). Quite intimate and a great group! We made mini pizzas, made gnocchi (Gnocchi di Patate in Salsa Gorgonzola was my favourite and Gnocchi di Patate in Salsa Agli Aromi! Fabulous! ), a vegetable dish called “Caponata di Verdure o Gurguglione “, roasted pork shoulder and turkey breast Tuscan style and a tiramisu for desert. A whole lot of food!!! So the entire family was invited to join us in wining and dining around the long table in the kitchen! I loved every moment of it! I should try and attend a cooking class in every country – It just gives you so much insight in their way of cooking and their culture! I absolutely love it! 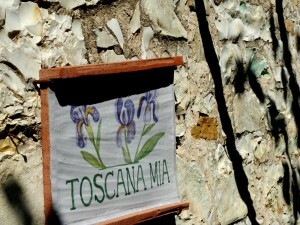 Toscana Mia!!! You will need Adobe Flash downloaded to see the picture slide show underneath every post I made! Previous PostThe Vatican City, The Sistine Chapel and the St. Peter’s Basilica … a whole new (old) world!Next PostA quick visit to SIENA…a Wonderful Medieval Experience in the hart of Tuscany! My brother suggested I might like this weblog. He was completely correct. This publish truly made my day. You can not imagine simply just how much time I had spent for this information! Thanks!